The Lake Forest Park Farmers Market is delighted to welcome community businesses and nonprofits to join our market for a day as Day Sponsors. 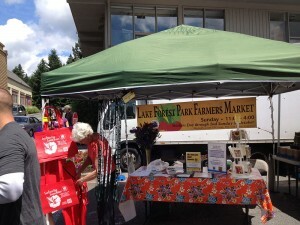 The LFP Farmers Market regularly hosts 7,000-9,000 people per market day, making it a terrific place to connect with the community and share information about your work or services. Day Sponsors have a table within our community tent where they can engage with the public and share information about what they do. Day Sponsors also receive a special social media shout-out prior to their visit to the market (hyperlinked whenever possible) and acknowledgement signage by the info booth on the day of their sponsorship. Get more information about day sponsorship fees, benefits, and guidelines by reviewing our Day Sponsorship Info Sheet. If you’re interested in becoming a Day Sponsor for the 2019 market season, please contact Lacy Moran at [email protected].